So here's another comic I knew nothing about, heard nothing about, and thought nothing about until about 30 minutes ago. Now I totally regret my ignorance. 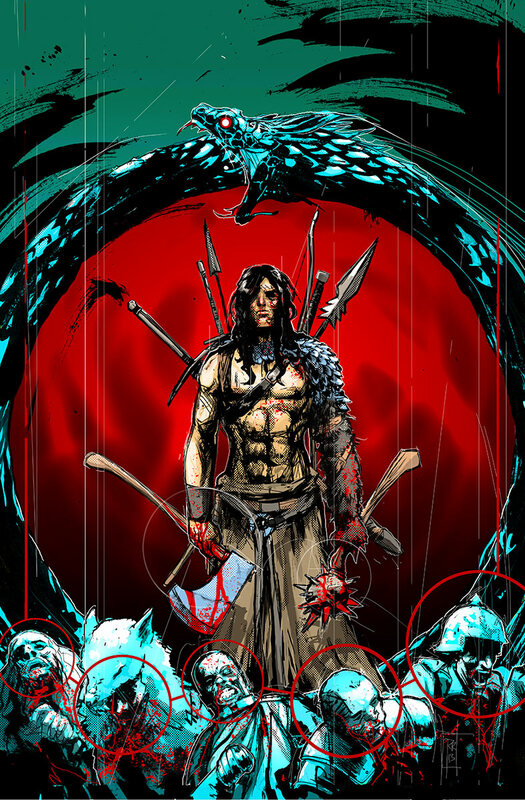 What the hell, Greg Pak and Valiant comics, why didn't you tell me that Eternal Warrior was so freaking awesome? Are you that selfish? Or have I just been ignoring your advances all this time, afraid to commit, worried I might get hurt again? If you haven't read any Eternal Warrior, drop everything you are doing (unless it is feeding a baby sloth or flying a plane full of kittens) and rush to your LCS and buy it now. I'm serious. If you think I am being hyperbolic when I tell you this book may be the zenith of modern comic book entertainment you would only be slightly correct. While I am giddy with excitement over this book, baby sloths and planes full of kittens are more important to our world. Pak had me hooked from the get go with this one. There is a huge story going on here, and he's putting a human face on it. He's placing the eternal struggles between good and evil, wilderness and order, and the male and female dynamic into the auspices of a family-drama. There becomes an emotional resonance to every twist and turn this story takes that otherwise would be lost without the interpersonal relationships between father and daughter and son. Things get more intense when blood is involved; remember what my grandma used to tell me, “Nobody fucks you up like family.” Pak is playing with fire here, and it's going to blow up real good somewhere down the line. When I took a look at the lenghty list of creators, my first thought was that too many cooks are going to spoil the stew. Then I punched myself in the face for using tired cliches. Despite the conglomeration of styles and ideas, all the people drawing and coloring Eternal Warrior #3 do a great job. You can see the change in perspective, but it flows. The timing of the shift in artists works and, in a way, adds to the pacing of the book. Since Valiant began its relaunch, they've been going for the big stories. What is happening in Eternal Warriormay be the biggest story of them all. I get the sense that Greg Pak is sitting back somewhere in his writing space, cracking his knuckles, smiling a knowing smile, and preparing to let loose a serious awesome bomb. I, for one, am camping out in ground zero.